MediHoney is a great agent to speed up healing. It works just as well, if not better than Santyl. It is much more affordable. I usually advise patients to apply to the wound once a day. MediHoney is sometimes used instead of a topical antibiotic ointment. 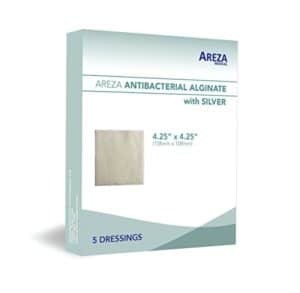 Silver Alginate is also a good product to absorb moisture and create a mesh grid environment for healing. Silver is a natural antimicrobial. This would be changed every 1-3 days. It can be combined with the MediHoney for a faster healing result. 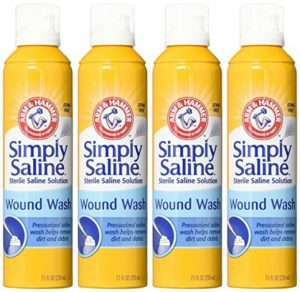 Saline wash is used before application of any wound care product. This is the way to clean the wound. Dry well after use. Best to use sterile gauze to dry the wound. Where do I order bandage supplies? Keeping the wound clean and dry will need lots of gauze. To save time and money order online. Save the receipt and submit to insurance for reimbursement. You might need a prescription from you doctor to have the insurance refund. What should I use on a really wet wound? 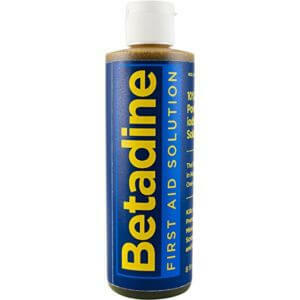 Betadine is used for really wet wounds. It is great between the toes or macerated skin. Topical Iodine and Betadine are the same thing. Long use is not ideal for wound healing. You need to give your body the nutrition needed to heal. Plenty of medical studies site this fact. Protein intake is very important. Vitamins and minerals also help. 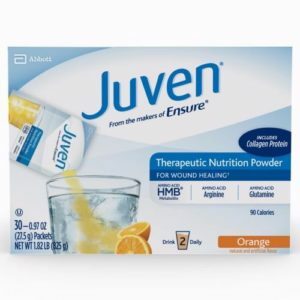 Juvien is a great nutrition boost.